This chapter offers a review of what is called positive psychotherapy (PPT) and the existing positive psychology clinical interventions (PPIs) currently being used in the field. We examine their efficacy and use within clinical and non-clinical populations. We further review the 24 character strengths, also used in PPT, as an adjunct to therapy and their corresponding over- and underuse. 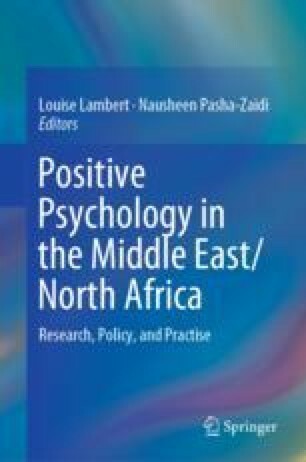 The chapter is further supplemented by the work of a Jordanian positive psychologist currently using PPIs and the principles of positive community development in different refugee hosting areas in Jordan. The lessons provided will be of value to clinicians in the region and elsewhere. Goodwin, E. M. (2010). Does group positive psychotherapy help improve relationship satisfaction in a stressed and/or anxious population? (Order No. 3428275, Palo Alto University). ProQuest Dissertations and Theses, 166. Retrieved from http://search.proquest.com/docview/822195958?accountid=14707 (822195958). Reinsch, C. (2012). Adding science to the mix of business and pleasure: An exploratory study of positive psychology interventions with teachers accessing employee assistance counselling. Master’s thesis, University of Manitoba, Winnipeg, Manitoba, Canada. Retrieved from http://hdl.handle.net/1993/14436. Smith, E. E., & Aaker, J. L. (2013, November 30). Millennial searchers (Sunday Review). Retrieved from http://www.nytimes.com/2013/12/01/opinion/sunday/millennial-searchers.html?_r=0.